#1 – Your family genes is causing gradual hair loss and a receding hairline. 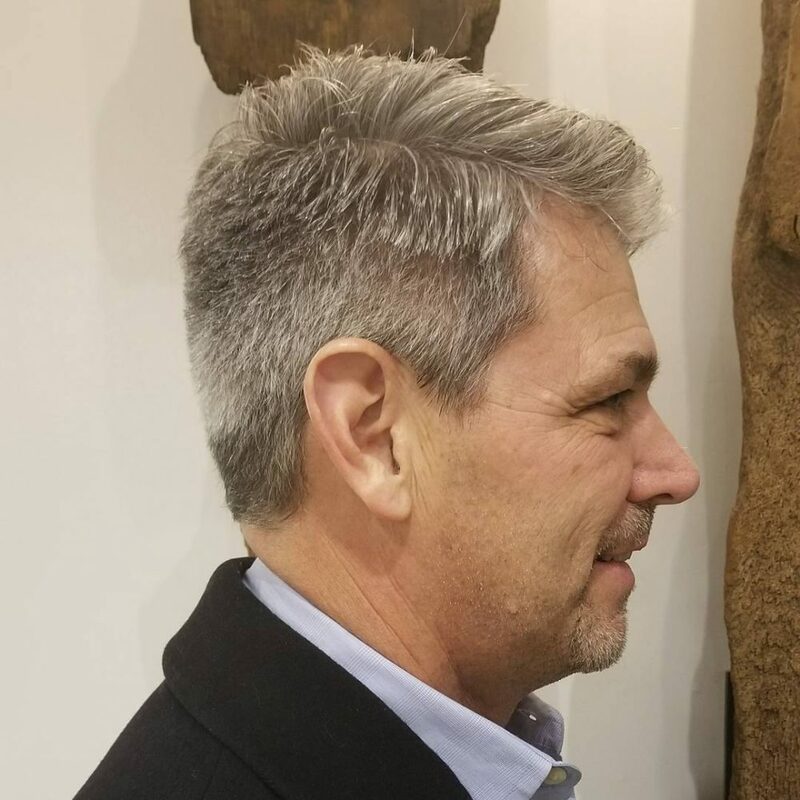 #2 – You have a full head of hair on the top of your head, but it doesn’t feel very thick. In this case, it has a naturally thin density. Either way, you can still rock a great haircut with thinner hair. You just need the right cut and styling products that will help in making the hair look thicker. Your barber will know which hair product works best for you. Minimalist cuts are always in style. 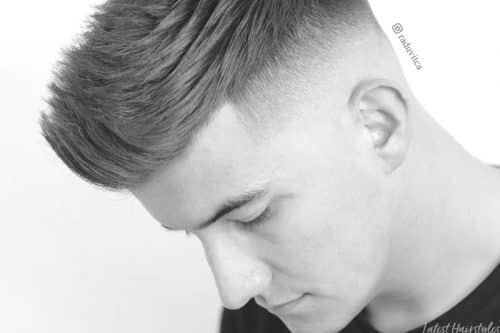 This cut puts a present-day touch to the military cut by brandishing thicker top hair. For the classic gentleman’s style with a modern punch, this one’s on the top of the list. The tapered fade make for the retro vibes of the ivy cut. 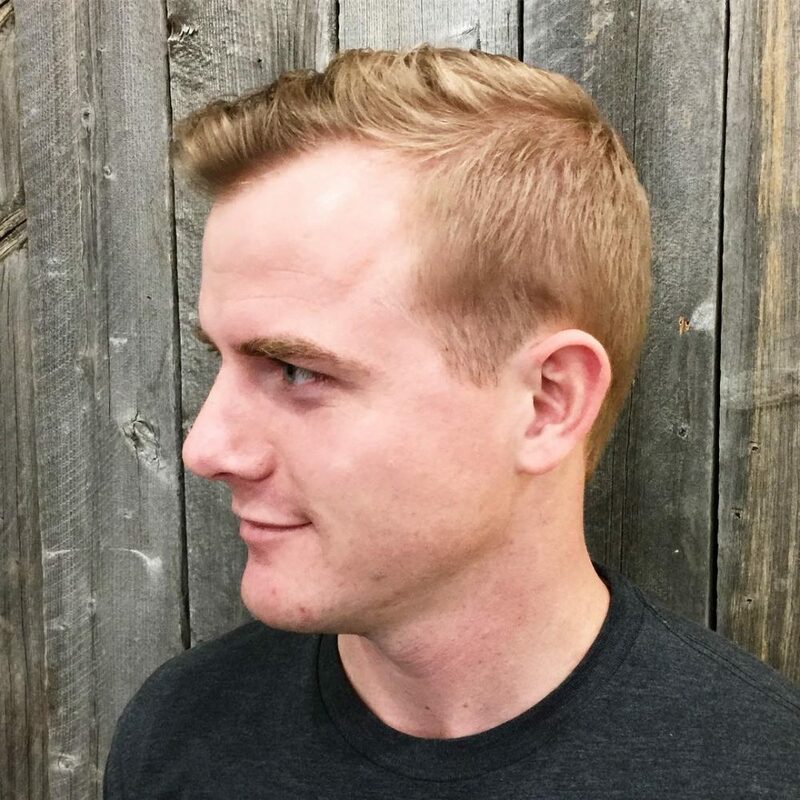 Looking for a hairstyle that is easy to manage, saves a ton of products, and is sharp and slick? Then this hairstyle is for you! 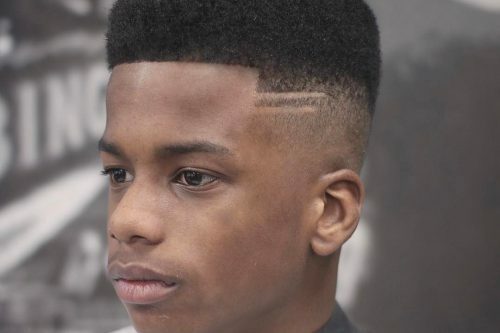 How can you extend a fade on the sides? Through a guard skipping technique, as you can tell. It works wonders in terms of aesthetics and innovation for the trained eye. It’s a great way to make thin hair look thicker. As Sun Tzu advises, turn your weaknesses into advantages. The fact that you have thin hair is not a problem, but an advantage if you know what to do with it. 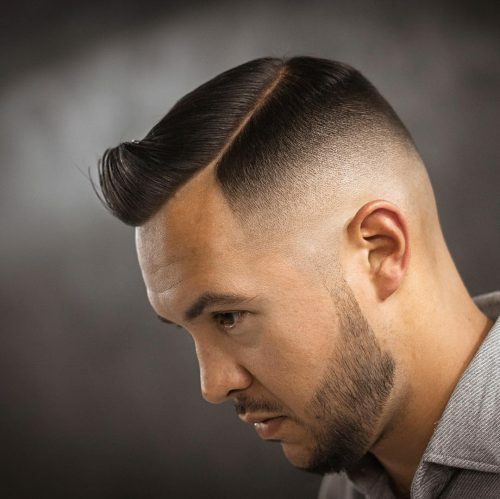 One way to go about it is this that makes the most of things by letting hair gather on top then pulled back one on top of another as to create a sense of fullness while cutting low the sides to contrast and augment it. 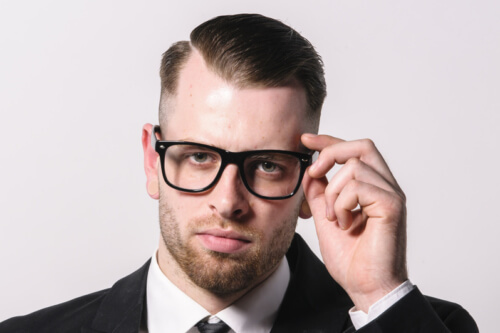 The bald fade with the beard and glasses gives a total hipster vibe, if that’s what you’re going for. 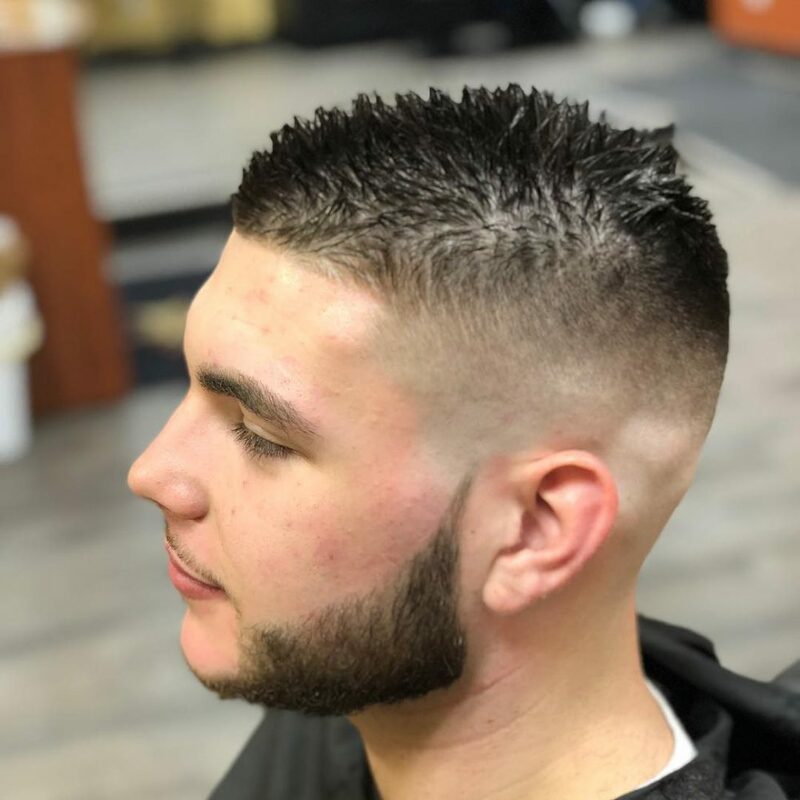 I would describe this as a modern conservative look for the professional man who desires a little more style with the tapered nape and temple area, along with the sharp lines. These are all my favorite parts of this cut. This is a very easy style that I believe would work on all gents with various lifestyles. This look is great for men with a straight & thin hair texture. This is a style that you can wash and go with very little time spent on maintenance. I recommend hair products like a mousse or even a leave-in conditioner, which I use often as a styling product. Allow the hair to air dry or you can blow dry for a more defined look. I like products that leave the hair soft and movable. A light hairspray could be used for a light hold if so desired. I would describe this look as texturized, hand-styled, and a bit messy (on purpose of course). The sides are faded from a one into the transition area with a skin taper in the back. 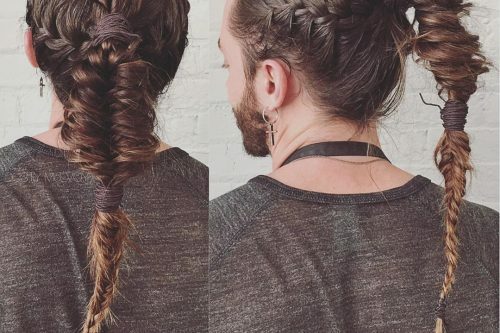 My favorite thing about this look is that it looks masculine (square sides) and it’s super easy to maintain for guys who don’t want to spend time on their thin hair. 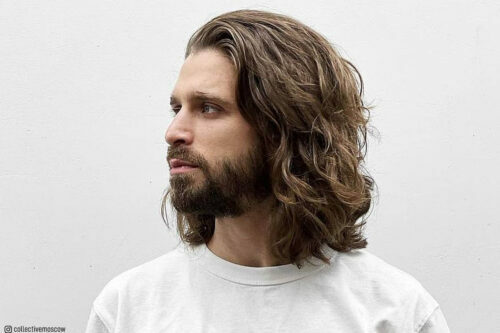 The number one thing for any guy to consider about their hair is their lifestyle. I always ask guys what their routine is and how much time they spend or want to spend on their hair. From there I make my recommendations. 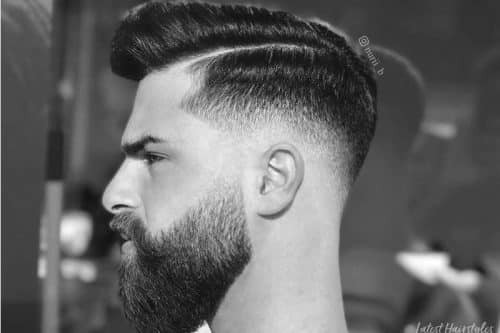 As far as face shape, I believe men’s hair is simple, keep it square! Square is masculine and round is feminine. It has more to do with lifestyle than anything else. 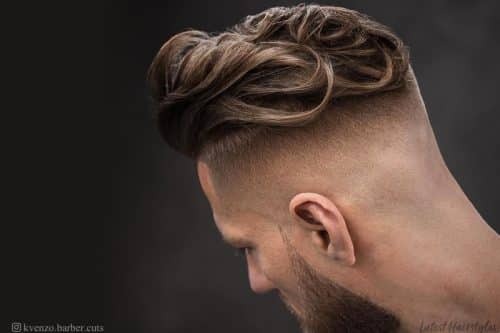 I love lots of length and pompadours and such, but some guys would hate to have to style it. My biggest advice styling-wise is to make sure you wet the hair and at least towel dry it to get it moving in the direction. 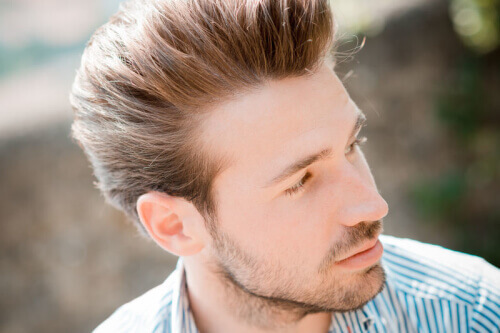 Once the hair is dry, use a matte clay or dry pomade to style. I love Reuzel, it’s all I use and sell. Their white can, which is a matte clay, is meant for this look. This haircut is a clean mature look. A lot of young men and athletes are sporting the full beard look today in our culture. It’s manly and sporty at the same time! I really like how the beard comes to a point at the top of this look to accentuate the round face. For product, I use my custom-made sandalwood and tea tree oil beard balm to soften and style the beard. I also use Ampro Coconut Oil Styling Gel to give the hair a nice wet look. It also has an attractive fragrance to draw the ladies to my clients! I rub the gel against the grain of the hair direction to spike the hair. No comb is involved at all! 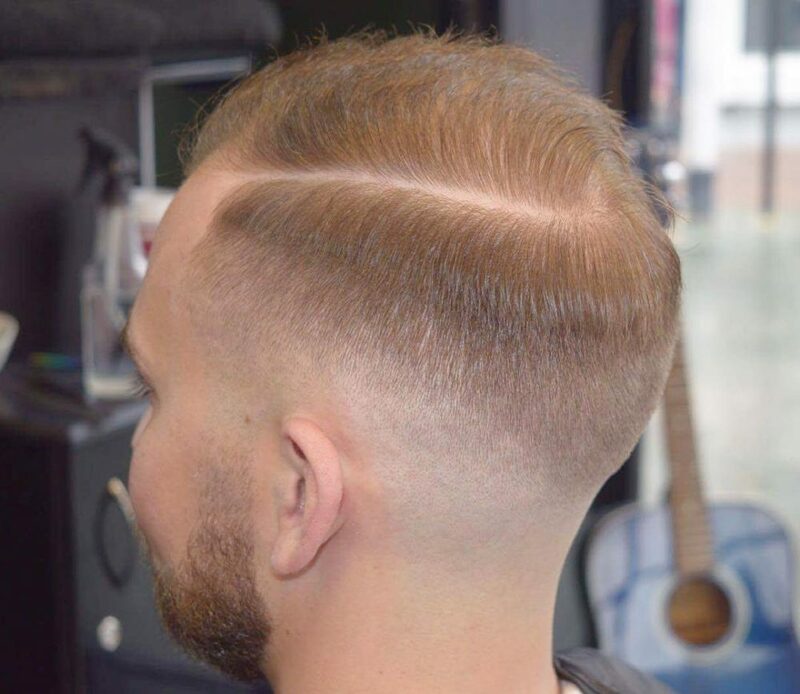 This is a classic skin fade on the side. I used outliners to bald the sides and Andis Fademasters to blend it up to the top with a 1 1/2 guard! 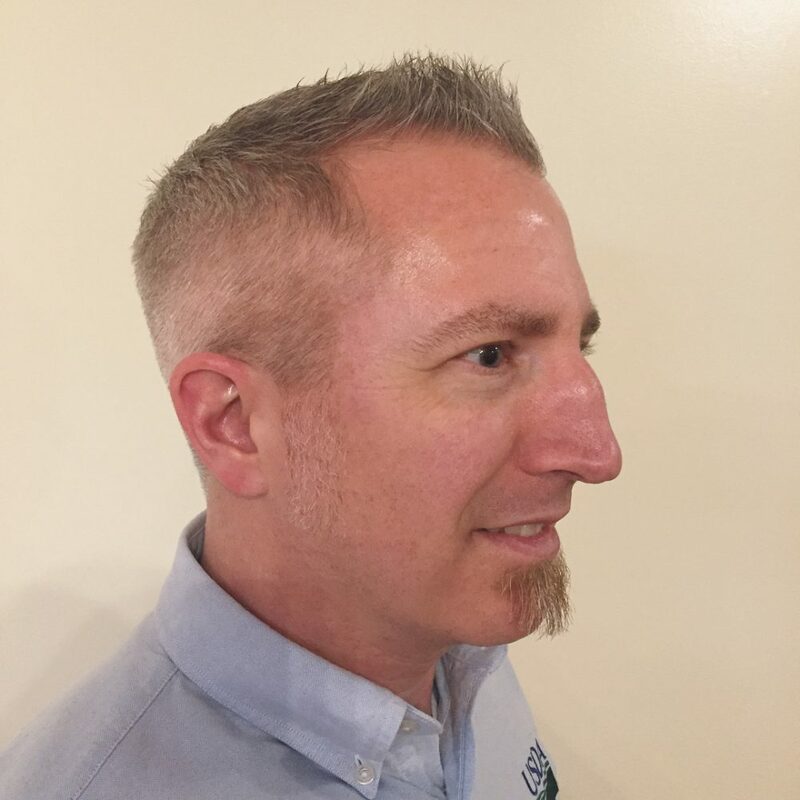 I used American Crew Shave Gel to outline the beard with a hot towel and straight razor. I would describe this look as a classic taper sides or business men’s haircut. My favorite thing about it is its versatility. You have the option for a hard part as it is styled in the photo, or without which gives a more laid-back look. 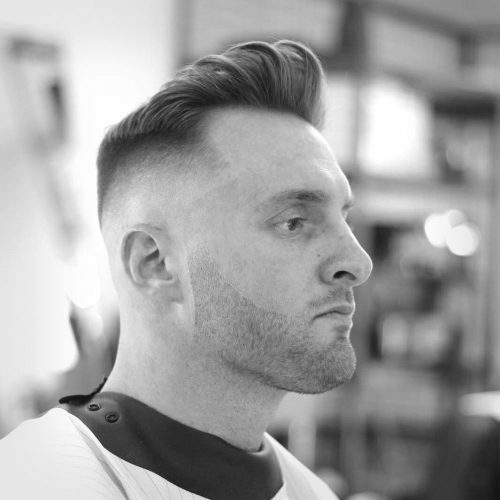 This look is perfect for gents looking for a modern and fresh style with minimal upkeep. It can be achieved with just a little product. Pomade was used for my guest to aid in controlling the hard part and to add shine. A mousse or gel would also work if styling wet hair. 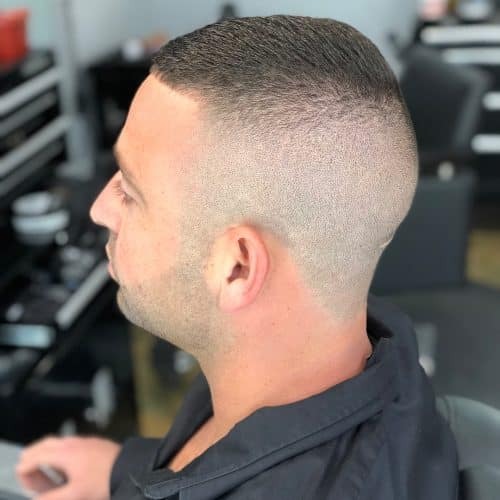 This look fits many face shapes, hair types, and lifestyles and can be altered to fit each individual by opting for a tighter fade in the back or a longer top. I would describe this look as simple and elegant with easy maintenance for the modern day gentleman. It is classy but rockstar at the same time, and looks fab in a suit and funky in denim. My favorite thing about this style is that you don’t need to run back to the barbershop in a week. 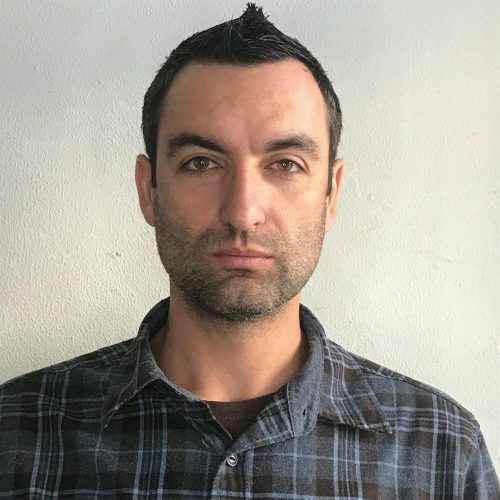 As long as you keep the neat part line and continue wearing it in the same shap,e it will grow out to a longer combover which best suits those winter months. This style can be achieved with wet or dry products. In this case, I have styled my client using a thick and heavy pomade to achieve a shiny, slick look. I simply rubbed the product in my hands and ran my fingers through his thin hair like a comb. This way you can see if the client likes a more natural finnish. Alternatively, using a wide tooth comb will give a very neat and perfect looking finish. Blow waving is not necessary unless you’re dealing with stubborn curls. Personally, I’m more a fan of letting your hair do its own thing as I believe the product is only the sprinkles on the cake. 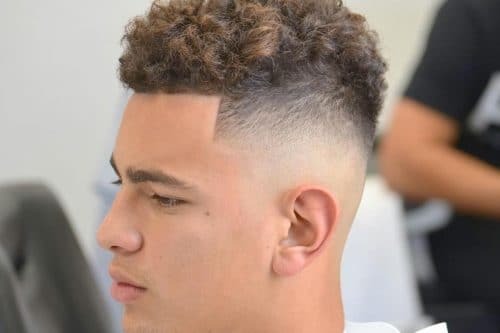 This men’s haircut with curly hair would look awesome with no product at all, providing the client feels confident with it. 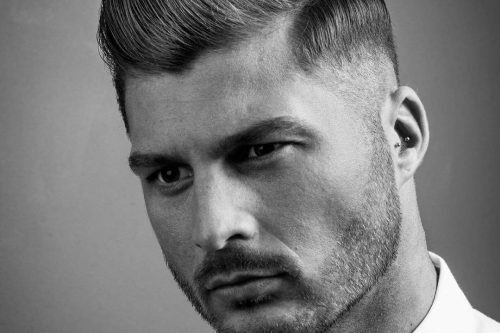 As for face shapes, this haircut doesn’t discriminate, although a sharp square jawline will get the heads turning. 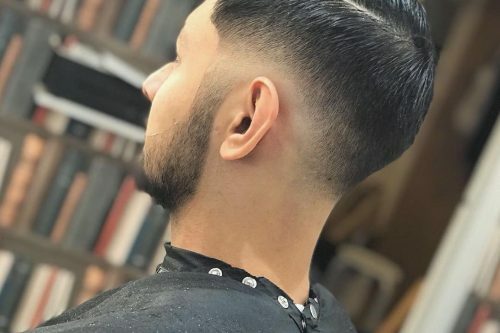 All in all, this style is for men who like a short, sharp and crispy clean hairstyle which is no fuss in the early mornings while getting ready for work. This is a very modern look. 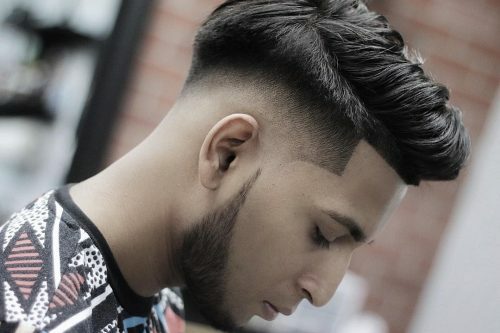 It is a good mix between the style of leaving it long on the sides and fading the sides extremely short. 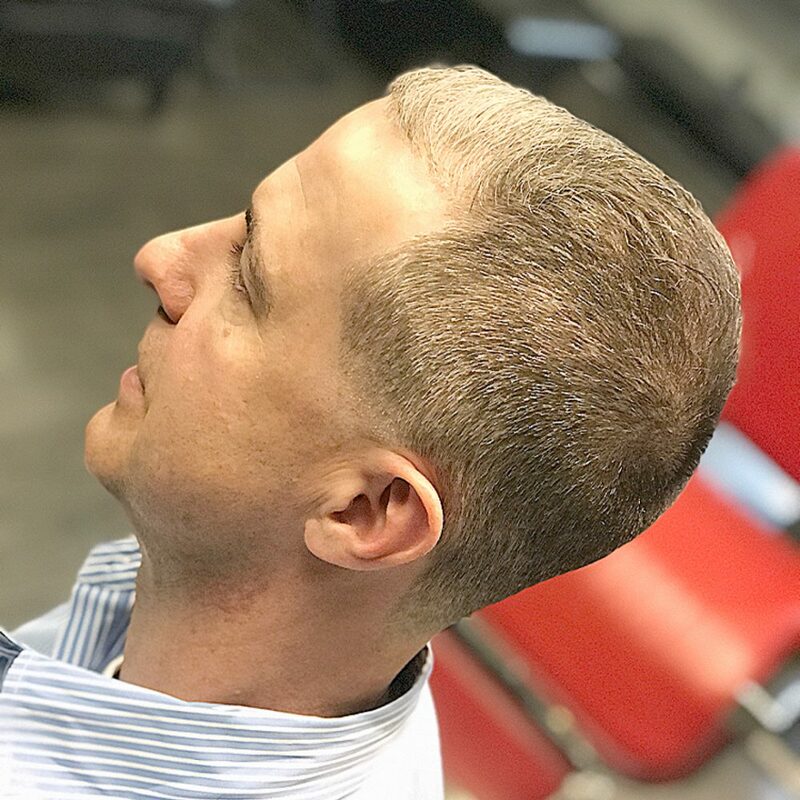 This haircut is great for people with thinning hair because the extra length both on the top and sides increase the appearance of volume of hair. I love this look especially for men with thinner hair, but also for medium thickness as well! For styling, I suggest using a paste for even more added volume and to keep the shape in place. 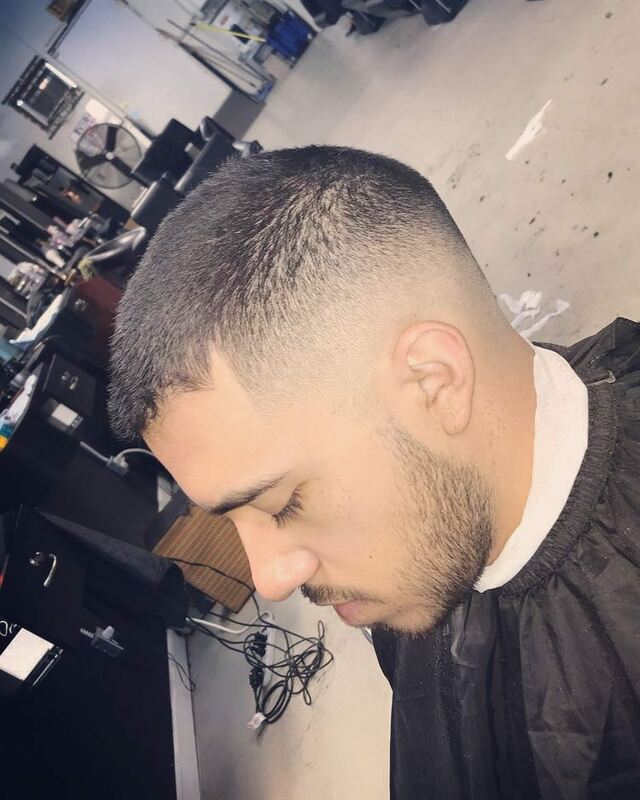 This is a great haircut for guys who don’t take too much time in the morning to style their hair, as well as those men that have a full hair routine. 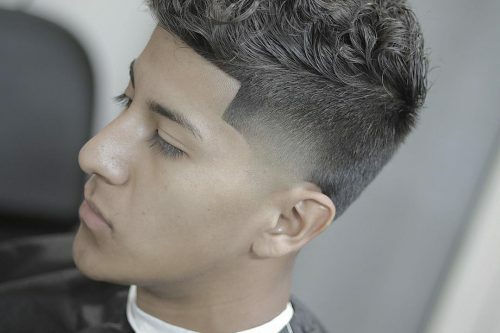 This is a tight and clean look that allows for a little fun expression on top. 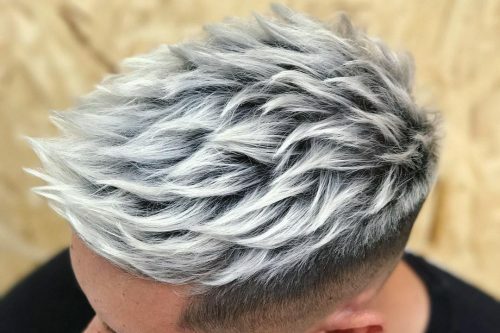 While I always love a strong fade, what I like most about this cut is the textured top. A textured top is my favorite to cut. Maybe it’s the feeling of breaking into the structure and messin’ it all up! A textured top is fun and fragmented yet organized. It really carries a hairstyle, giving it personality and attitude. If you are considering a look such as this, be armed with your favorite finishing product (a clay or paste works great) and be prepared to be wowed by the ease and abbreviated styling time. It’s a no-muss, no-fuss coiff that is great for that man who doesn’t like to spend the time styling his hair. Just mess it up and be out the door. Easy as 1-2-3! I describe this hairstyle as a mohawk fade with a wet, spiked up finish. I recommend it to people who want to look juvenile even if they are wearing a semi-formal suit. 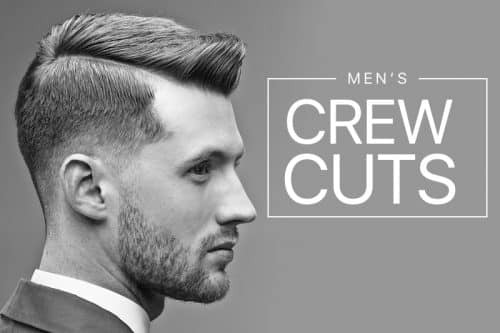 I primarily use Alpha Products, but also love to use American Crew for this type of hairstyle. I prefer to apply this look to people who have had a fresh facial and clean face. I mean no facial hair, but it really depends on the shape of the client’s face. It looks more accurate when you have a very clean facial look. 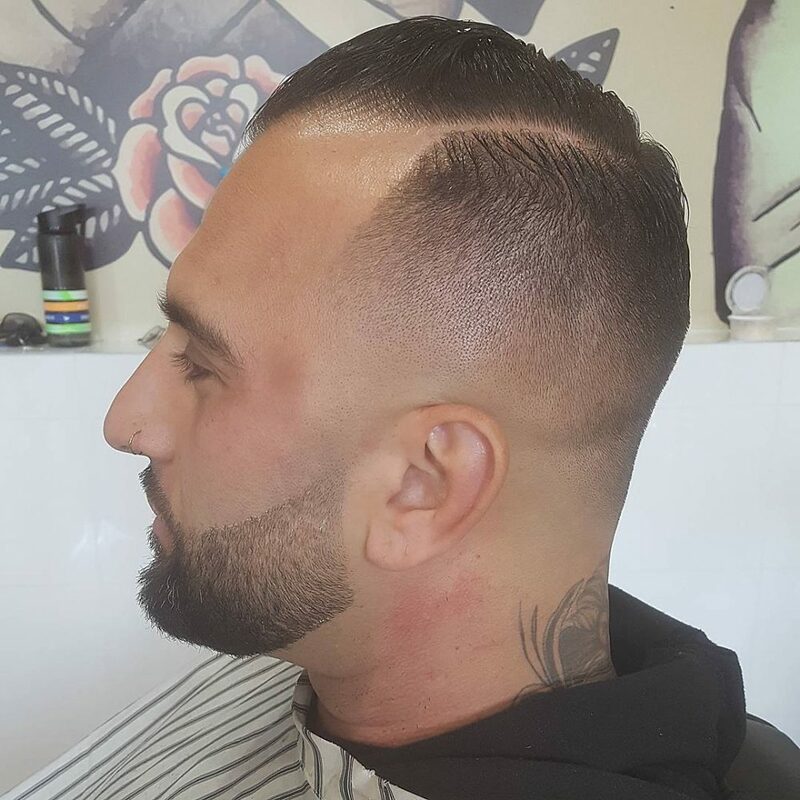 This is a medium straight razor shaved fade with a natural side part. My favorite part of this look is the simplicity and cleanliness of the look it gives the client. 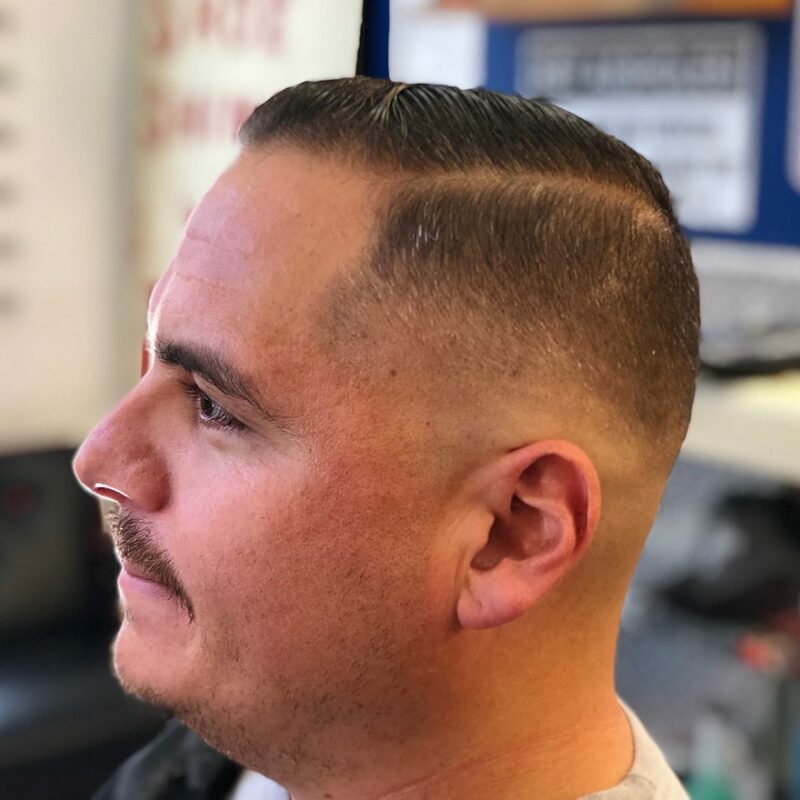 Here I have used Suavecito Firme Pomade, but you can also achieve this look with Tip Top Pomade and/or Shiner Pomade. I highly recommend all of these products because of their water soluble base, and because they give that wet look without damaging or giving dandruff to the scalp. This looks good on any client with an oblong, oval or diamond shaped head. Clients with thick or thin hair can rock this look but, clients with thinner hair get that extra clean look. 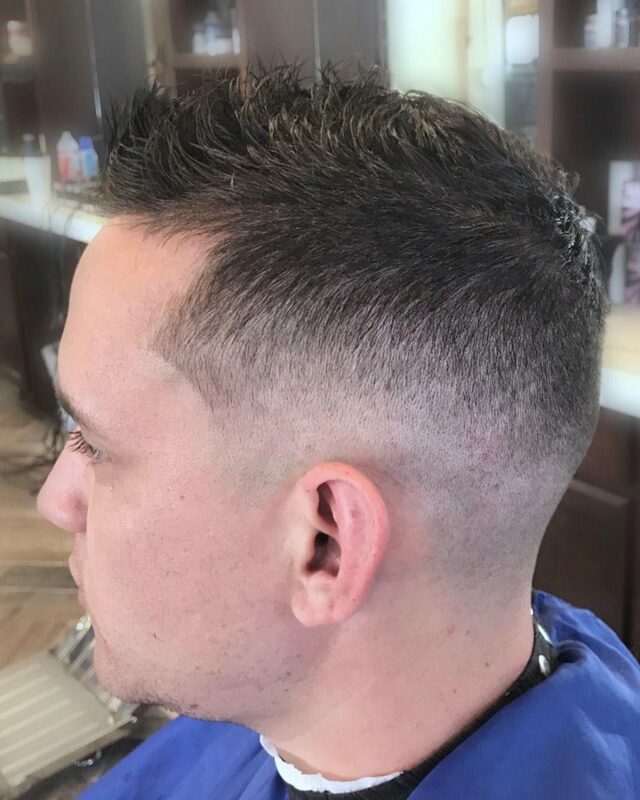 I get a variety of clients that request this look and I love to cut their hair because with this look, no matter what you do or how you dress, you’ll always look fresh. 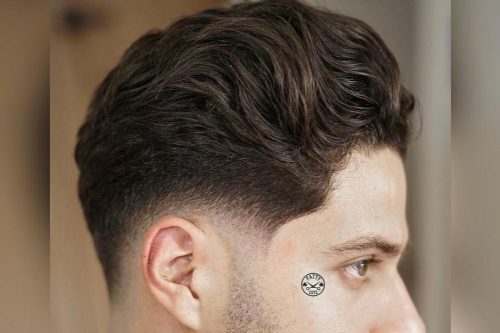 This look is a simple fade with a number two on top. It’s almost a buzz cut, but not quite. I love it the way it blends in with the top of the hair which brings more definition to the client’s face. 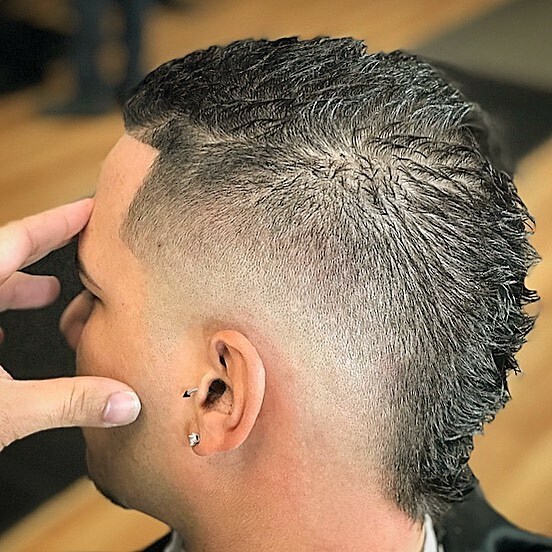 I don’t like to go super bald on the sides because there is a time and place for those fades, but I feel as a barber, you should envision the haircut that best fits the client’s face and masculinity. 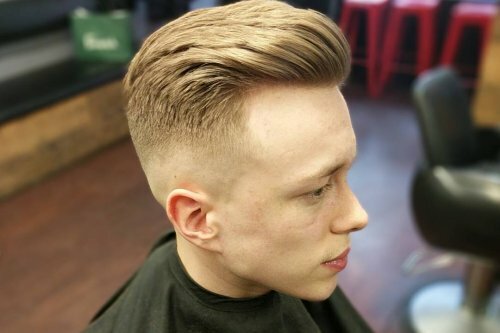 This look can be styled with a strong pomade, or even with a simple gel like Johnny B. I can also create this fade to where no product is needed and it has a dry look to it. Sometimes less is more! 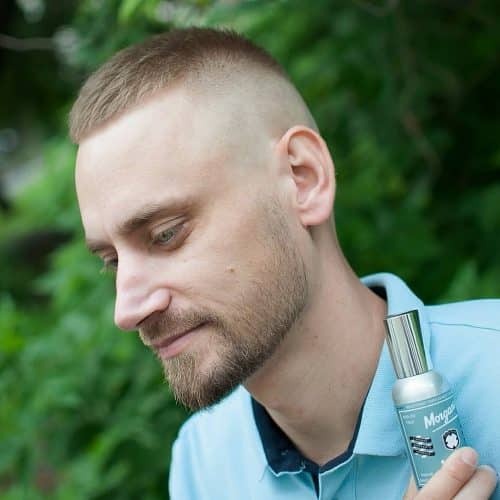 This is definitely for guys who like to have low maintenance hair. A slimmer face structure is greatly preferred for this type of cut. This would best fit any man who would want a clean-cut look that would give off a great first impression. This is a low skin bald fade. My favorite thing about this is the blending. 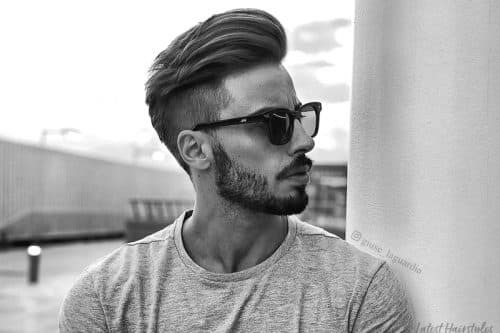 This style is a nice clean cut for guys who want to keep it short. I use a very small amount of Johnny B. You don’t need a lot of gel because using just a little bit gives it that nice bright look. I also use Red One Agua Hair Gel Wax. Both products work well! I recommend this look to anyone of any age whether they have thick hair, thin hair, curly hair or straight hair. I believe the low bald fade looks good on any face shape and size and this haircut suits any lifestyle. 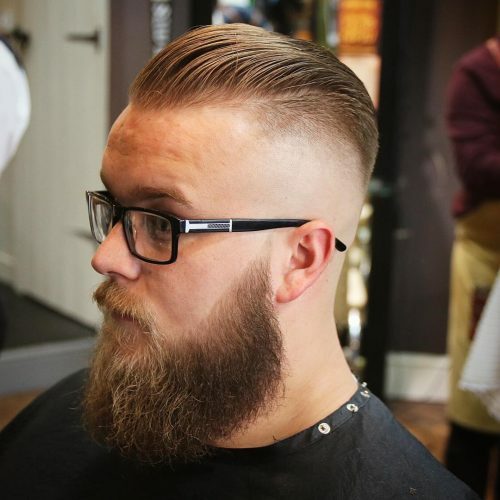 I would describe this style as a skin fade with a hard parting, pushing the longer hair on top over to make a slight pompadour haircut. 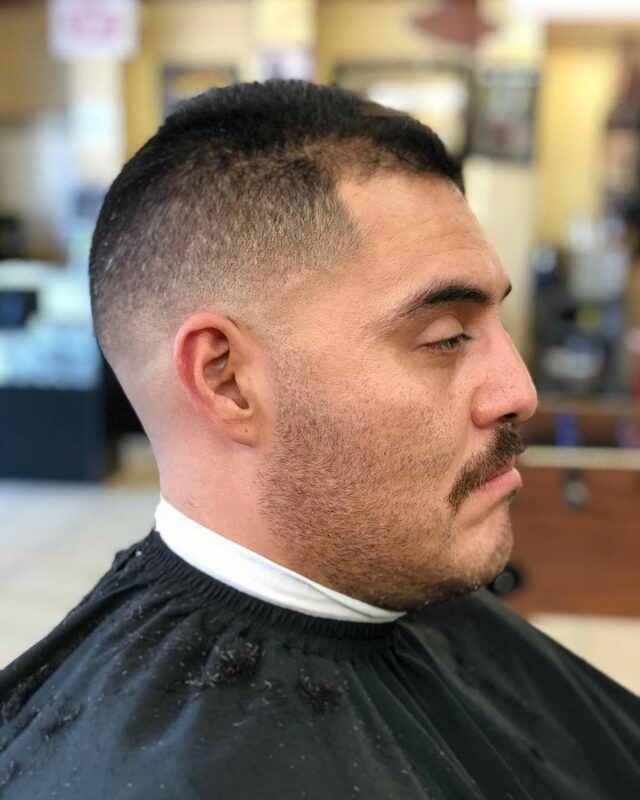 I did the fade using a Wahl foil shaver to take it right down to the skull on the sides. 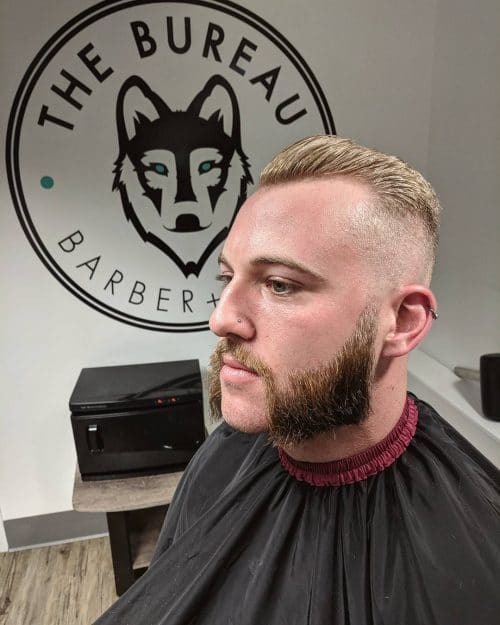 My favorite part about this is the shaved parting as I think it adds a sharpness and defines the haircut with the harsh line. My client’s hair is very fine, so I opted for something that wasn’t greasy to make sure it didn’t weigh the hair down. I used Bed Head Matte Separation Workable Wax and finished it with hairspray. This seems to be the most popular haircut in the shop where I am training (Cavalier Club, Bedford). I feel it is one of the most versatile looks that can be adapted for a wide range of clients. 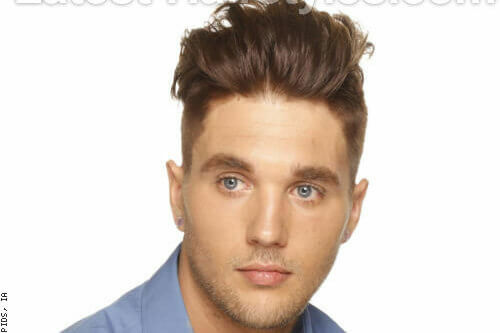 This particular model has quite thin hair on top, but this style works well with what he has and you can find a nice balance with the faded sides and back and heavier top section. This particular style is a timeless classic and suits white collar workers whilst still making a statement. It’s one of my favorites. Comb hair towards the center and brush up for the classic fake mohawk.